This entry was posted on April 9, 2018 by ND T4D. Every spring, leading watch brands congregate in the Swiss city of Basel for the industry’s most important fair, Baselworld. It’s been a few days since the six-day show ended, so we’ve had some time to take a closer look at the hundreds of luxury watches that were released. Among them, here are four of what we think are the best new watches from Baselworld 2018. It’s finally back! The stainless steel GMT-Master II “Pepsi” rejoins the Rolex catalog after over a decade of absence. 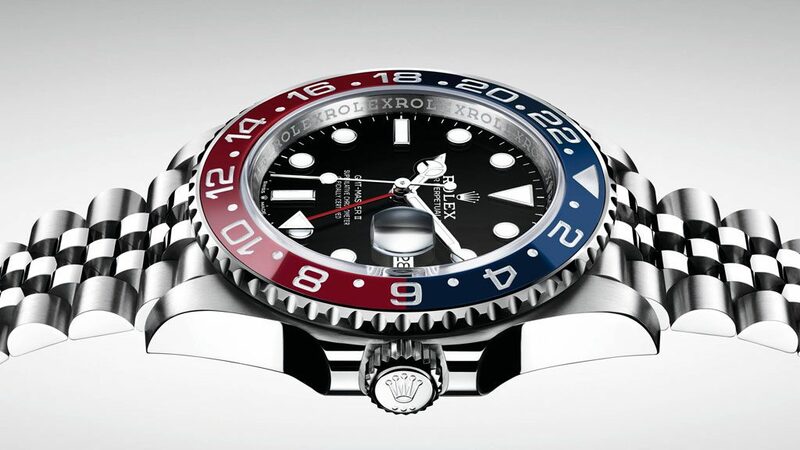 Rolex fans everywhere have been waiting for a modern version of the steel GMT-Master II with the iconic red and blue bezel since the only Rolex Pepsi available prior to this year was the 18k white gold version, the GMT-Master II ref. 116719BLRO. The new steel GMT-Master II ref. 126710BLRO comes with a Cerachrom ceramic bezel on top of its 40mm Oyster case, in addition to a steel five-link Jubilee bracelet. It’s interesting to note that Rolex now refers to the steel on the new GMT-Master II pilot watch as Oystersteel rather than 904L steel. Coupled with the striking new look of the GMT-Master II Pepsi is the brand new movement powering the famous Rolex watch. The Rolex Caliber 3285 automatic movement drives the two time zones and date function and offers 70 hours of power reserve. 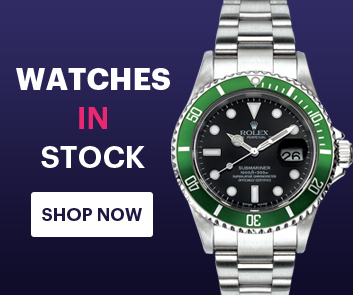 It’s no secret that we love a bejeweled Rolex watch here at Time 4 Diamonds and the new Rolex Daytona ref. 116595RBOW certainly does not disappoint. Crafted in solid 18k Everose rose gold and flaunting a diamond-set case, a rainbow sapphire bezel, and colorful baguette-cut sapphire hour markers, the new Rainbow Daytona is a feast for the eyes. What’s more, for added effect, the black dial is also home to three shimmering pink gold crystal subdials. Beneath all the stunning gem embellishments is Rolex’s famous Daytona chronograph watch sporting a 40mm Oyster case and Oyster bracelet. Of course, at the heart of the watch is the reliable and durable Rolex Caliber 4130 automatic in-house movement with a 72-hour power reserve. Patek Philippe is well-known for their fine perpetual calendar watches and their luxurious yet sporty Nautilus watches. So it’s a great treat to see these two exemplary Patek hallmarks come together in the new Patek Philippe Nautilus Perpetual Calendar ref. 5740/1G. Fashioned in 18k white gold from head to toe, or case to clasp, the new Nautilus Perpetual Calendar sports the familiar porthole shaped 40mm case and the signature integrated bracelet. On the classic blue sunburst dial with horizontal indentations sits the impressive range of functions of the new Patek Philippe watch—time, day, date, month, leap year, moon phase, and 24-hour displays. Thanks to the Caliber 240 Q automatic movement, these functions are able to automatically adjust by accounting for varying days in a month, as well as the occurrence of leap years. Always aiming to surprise their audience with innovative materials, Hublot has taken their flagship Big Bang UNICO watch and dressed it in fiery red. The new 2018 Hublot Big Bang UNICO Red Magic includes a 45mm case made almost entirely in red ceramic using a Hublot-patented process to achieve the vibrant hue. Continuing with the scarlet shade is the red rubber strap with black accents coupled with the bold red accents on the skeletonized dial. Peeking from under the dial is the Unico HUB124 manufacture automatic chronograph flyback movement with 72 hours of power reserve. Limited to only 500 pieces, this is one hot Hublot that brings the heat!